What to use for Breast reduction scars? I have read the dermarolling instructions as well as many other forums on this blog. However, I am still a little confused about what I should use on my scars. I had a breast reduction about a year ago and have a mixture of wide scars, raised scars, and hyper-pigmentation. What tool is the best to use? 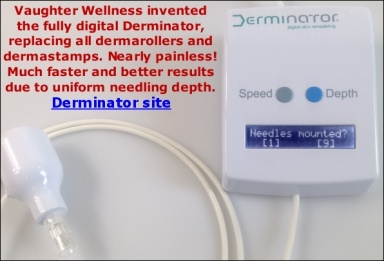 The 1.5mm one line dermaroller, the 1.5 dermastamp, or the single needles? Thank you! Re: What to use for Breast reduction scars? I recommend a 1.5 mm dermastamp with 35 needles. Stamp all the scars densely and thoroughly every three weeks. For the hyperpigmented scars, try also our 0.05% Tretinoin cream. Apply it every second day.